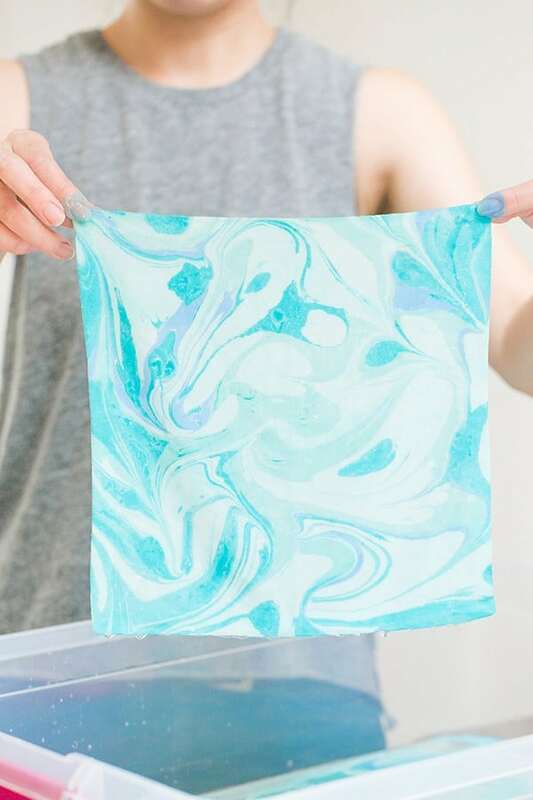 How amazing is this DIY Fabric Marbling technique? 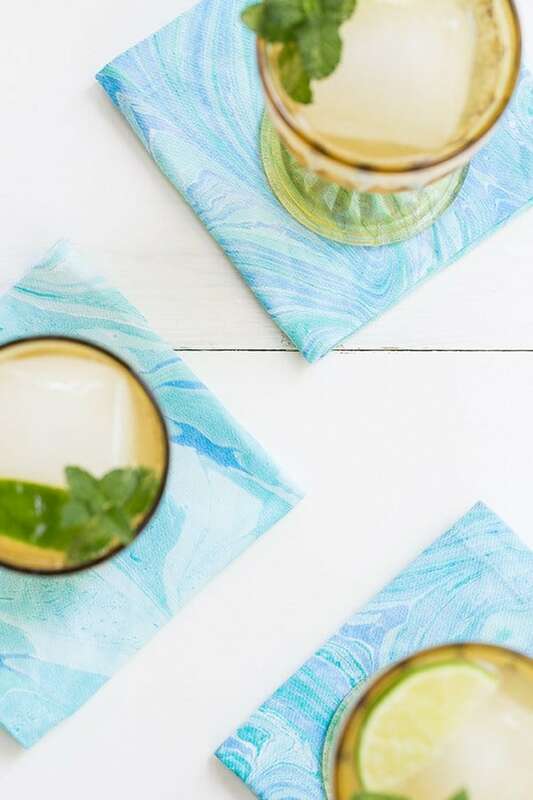 Fabric marbling is such a unique method and an awesome way to create a cool pattern you can somewhat control and transfer to other surfaces. 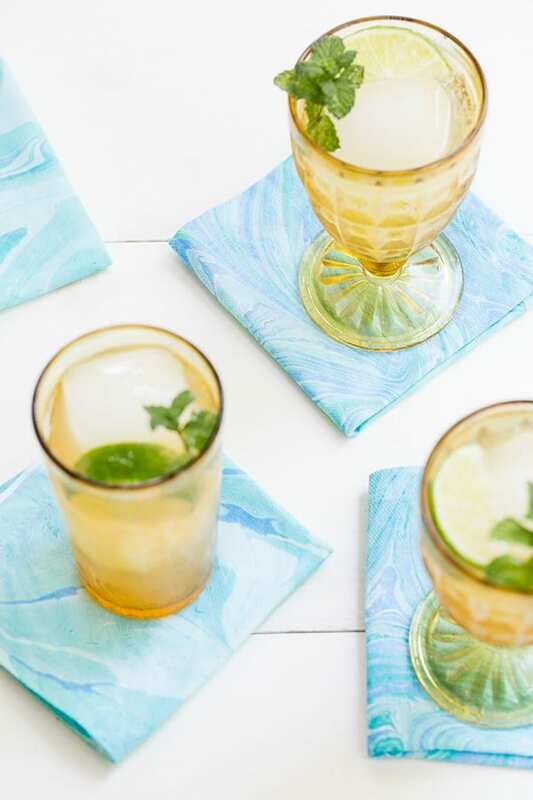 We had a blast creating these cocktail and dinner napkins to use for parties or events! The process was timely, but so much fun. Once you actually see the paint adhering to the napkin, it’s totally worth it!! We wanted to marble every fabric item around us. It was pretty awesome and worth a try! Directions below and happy marbling! Alum, Methocel for Marbling, Ammonia, Golden Acrylic Polymer, Acrylic Paint in whatever colors you want, white dinner napkins, white cocktail napkins, large shallow storage bin that allows napkins to lay flat when marbling, bucket of water to the side to rinse fabric once marbled, whisk, measuring cup, small cups for paint, wooden sticks. 1. The trick to adhering the paint to fabric is presoaking the fabric in alum. You can do this the night before. Mix 3 tablespoons alum per 1 quart of hot water. Let the alum dissolve, then soak the fabric for 20 minutes. Hang to dry completely before marbling. 2. In the large flat bin, prepare the marbling base by mixing 4 tablespoons Methocel and 1 tablespoon Ammonia per gallon of warm water. Whisk until it’s completely mixed and then let it sit for 1-2 hours until the mixture is thick and most of the bubbles have dissipated. 3. While you wait, prepare small jars of Acrylic Paint. Squeeze about 2 tablespoons of paint into the jar and slowly thin using Golden Acrylic Polymer until it’s a milky consistency. 4. 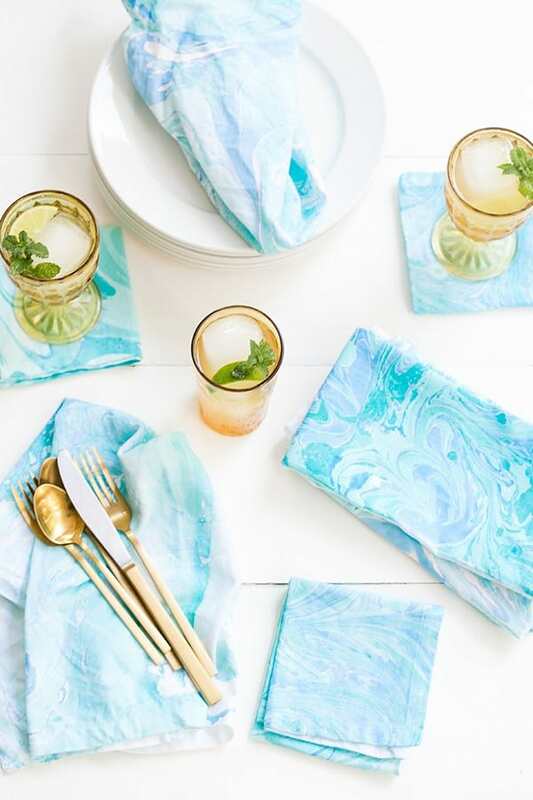 Iron your dried and prepared napkins. 5. Once the bin mixture is set, go through and pop any bubbles that are still remaining. Then drop the paint colors on top of the mixture using popsicle sticks or skewers. You can layer paint colors, place different colors on top of each other, etc. Some paints will spread out more and others will go on a little thicker and that’s okay. 6. 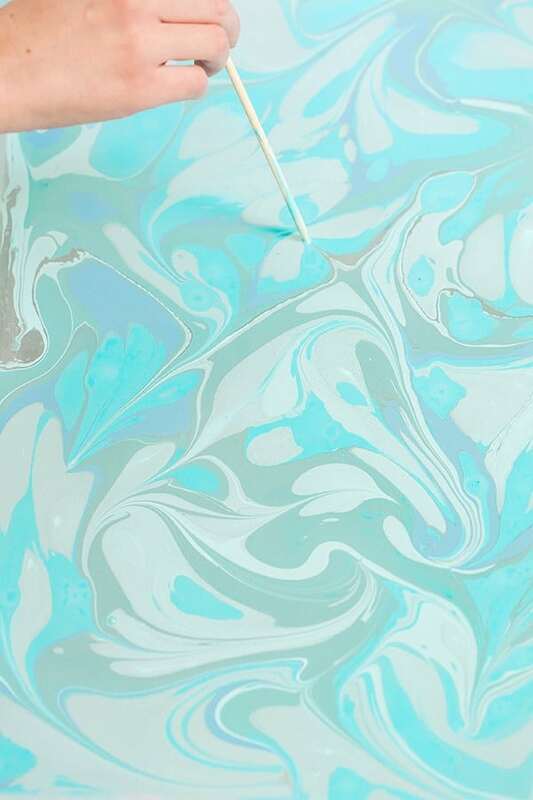 When you’re satisfied with the colors you’ve placed, take the fine tip of the skewer and drag it through the paint to create a marble pattern. 7. Once the pattern is ready, place the napkin flat down on the surface. Make sure every inch of the napkin fits flat inside the bin. Whatever the napkin touches, will be transferred to the fabric. You can see the pattern adhere from the backside. 8. Take one side and lift towards you, pulling the napkin up. 9, Transfer the napkin to the clean bucket of water next to you and rinse. Then hang to dry or lay flat on a towel. Enjoy this super fun project and stay charming! I love this DIY! The fabric turns out so pretty. I would definitely have a lot of fun doing this. I just wish the supplies were cheaper! 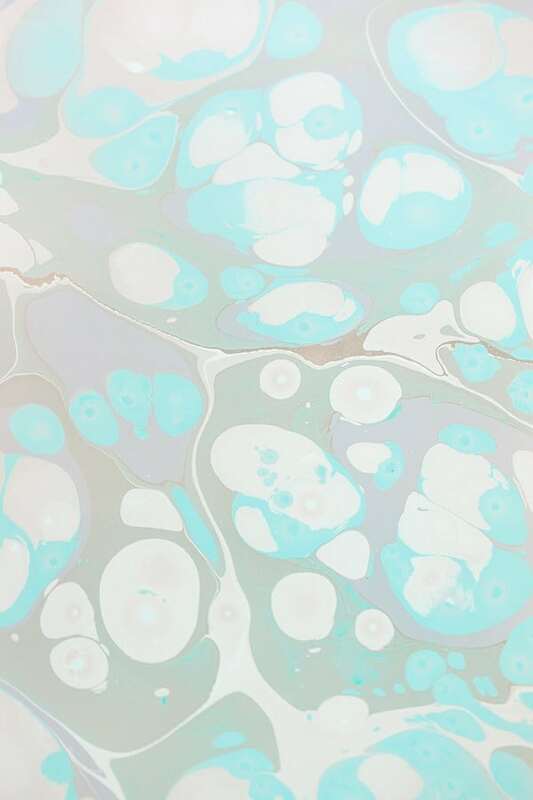 I love all these marbling ideas! So awesome! These turned out so pretty! 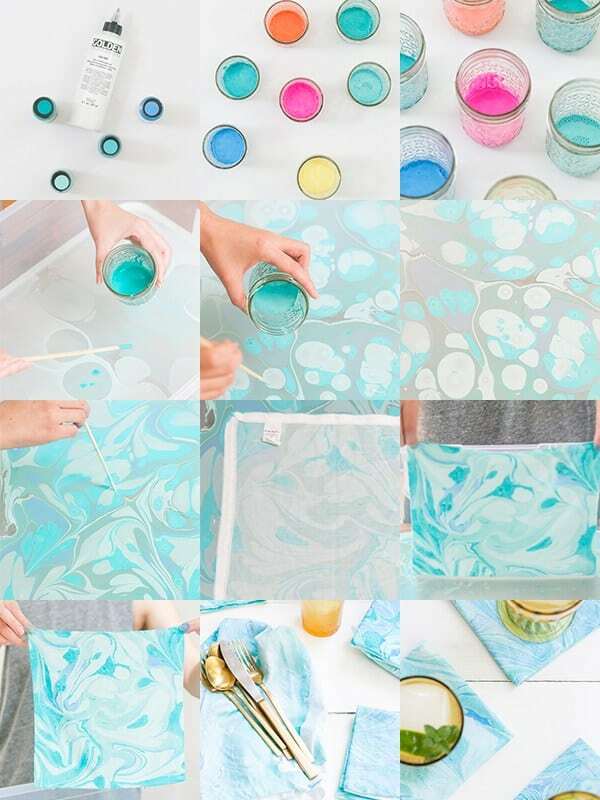 I definitely need to give this marbling trend a try! 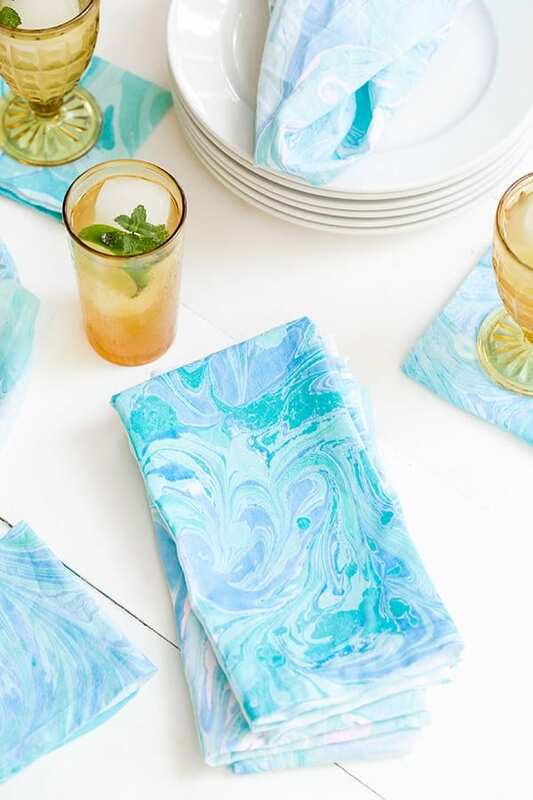 Since this project is shown in a dining setting, is the end result safe to use as normal napkins, I.e. on the mouth or to wipe hands? We always suggest doing your own research, but for us we do use these. You can wash them in the washing machine and dry before doing so. Wow! These are adorable. I love the colors you used. 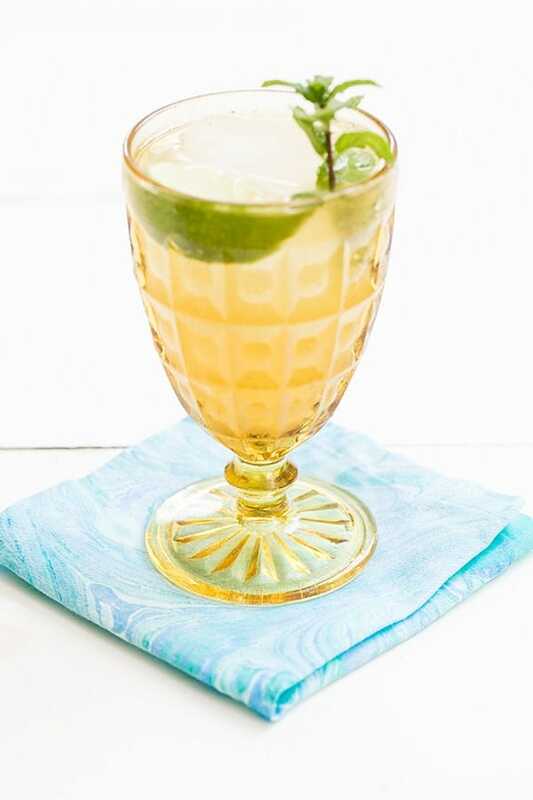 Can’t wait to try and make my own! What kind of paint that u use to dye the fabric? Are u can use that technique for any kind of fabric? I have tried this technique but what is missing from the samples is the brightness of the colors! I have used every chemical except golden acrylic polymer. I live in India where there is no such thing available! Can you suggest it’s substitution? Do you use cotton napkins? Or fabric? 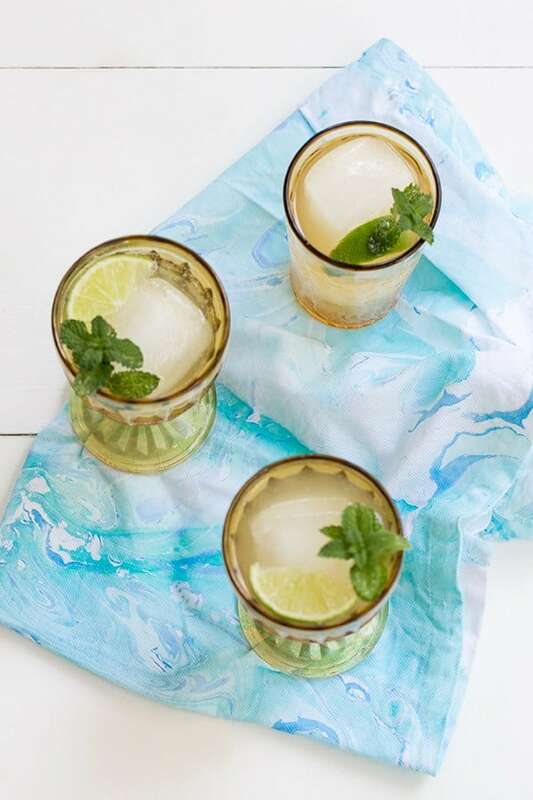 I saw this technique with silk,is there any difference? For paint it brought me to amazon Martha Stewart multi surface acrylic satin does that matter satin or just acrylic? Do you have a video of this? We used a cotton napkin and it worked great! We linked all of the products in the post and recommend using those to achieve the same desired look. We don’t have a video, but that’s a great idea! We did some marbling in a class. It was a lot of fun. I wish the supplies were cheaper too. As for those asking about this golden polymer replacement? It is acrylic paint and we just watered it down a bit more. Can you substitute silk dyes for the acrylic mixture? We have not tried that, but it might work!